The International Monetary Fund (IMF)'s forecast that the Indian economy will be the fastest-growing major global economy - outpacing China - by 2016-17 saw the country's benchmark indices climb to record levels. 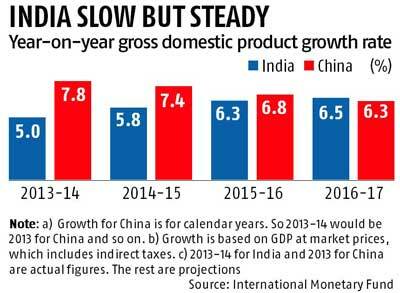 IMF in its latest World Economic Outlook report pegged India's economic growth rate at 6.5 per cent for 2016-17, higher than China's projected growth rate of 6.3 per cent. The benchmark BSE Sensex gained 1.85 per cent to end at a new record high of 28,784.67, topping previous all-time high of 28,694 touched on November 28. The broad-based Nifty, too, registered a new high of 8,695.6 gaining 144.9 points, or 1.69 per cent. Strong global cues from other Asian markets and gains in European markets amid speculation that the European Central Bank will announce quantitative easing this week also boosted investors' sentiment. IMF, however, lowered global economic growth forecast for 2015 and urged central banks to purse an easy monetary-policy stance and asked governments to pursue structural reforms to support growth. Taking note that India is better placed than rest of the world, foreign investors pumped in Rs 1,275 crore (around $200 million) into Indian stocks on Tuesday. "For India, real GDP [gross domestic product] growth is projected to strengthen to 5.4 per cent in 2014 and 6.4 per cent in 2015, assuming that government efforts to revive investment growth succeed and export growth strengthens after the recent rupee depreciation," IMF said in the report titled Recovery Strengthens, Remains Uneven. The IMF report came on a day when Chinese official data showed the country's economic growth plunged to a 24-year low of 7.4 per cent in 2014. Experts believe India has tremendous untapped potential that can be unleashed with the right economic policies. Finance minister Arun Jaitley said he was glad IMF had given such projections. He, however, stuck to 5.5 per cent growth (GDP at factor cost) for the current financial year. India's former representative at IMF Arvind Virmani said India's growth was reduced below potential due to "what was done through omissions and commissions since 2010". 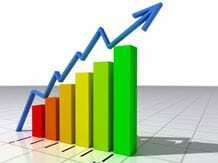 "Now, growth is recovering. The issue is how quickly India would go back to its trend," said Virmani, who has also served as the chief economic advisor to the Union government. On the other hand, he said, China is an export-oriented economy. "It would have slowed after the global financial crises, but its economic growth was propped up through credit pumping. I had said in 2010 that there is a time limit of three-five years to this credit expansion and China would slow down significantly when it stops." That is what was happening since last year, Virmani said. "If China kept on pumping credit into economy it would increase the chance of melt down," he added. The IMF report noted external factors were much less important compared with internal factors for some "relatively large or closed economies", such as China, India and Indonesia. 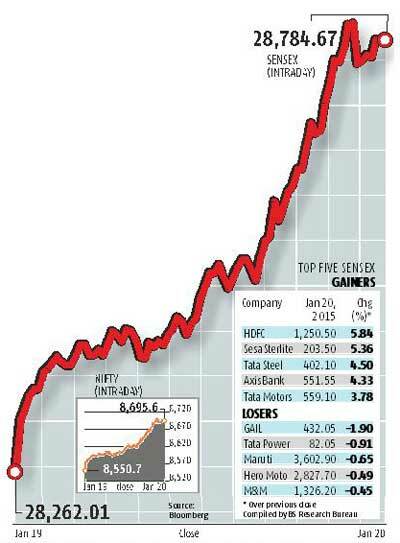 Financial stocks led by HDFC & Axis Bank and metal shares, including Tata Steel and Hindalco, were the biggest gainers on Tuesday. "The market touched all-time highs as both global as well as local investors were huge buyers. There is a left-out feeling amongst domestic investors, who are hugely underweight on equity as an asset class," said Motilal Oswal, chairman and managing director, Motilal Oswal Financial Services. Most analysts predict Indian markets would gain up to 20 per cent in 2015, led by the Modi government's reform push. "We remain positive on India's medium-term economic story, noting the government's focus on economic development, India's favourable demographics and improving macroeconomic position," said Sanjeev Prasad, senior executive director and co-head, Kotak Institutional Equities. "However, current market valuations factor a lot of the positives even before any meaningful pick-up in economic activity or earnings upgrades." Following a sharp 30 per cent rally in 2014 and 3.3 per cent this month, India's benchmark Sensex now trades at valuations of nearly 16 times one-year forward earnings compared with 10.6 times for MSCI Emerging Market index. Nomura, which has one of the highest year-end target of 33,500 for the Sensex, sees India moving towards higher structural trend growth. "Our bullish stance on the Indian market for this year is based on our high-conviction view that the improvement in India's macro-environment over the past year is durable and will improve further. The lagged effect of the much-needed complete overhaul of the political economy is a significant tailwind," said Prabhat Awasthi, managing director and head of equity, Nomura India.